The beginnings of the overall West I-40 Diversion Project were presented at the August 22, 1974 AMAFCA Board meeting, where the Board adopted the West Albuquerque Metropolitan Area Drainage Management Plan. AMAFCA commissioned the plan to analyze the watershed and facilitate the efficient use of funding for future drainage infrastructure on the West Mesa area of Albuquerque. As development on the Westside of Albuquerque continued, private funding was utilized to update the plan many times. 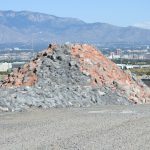 The intent of the drainage plans were to outline projects which would diverted flows that historically reached the South Valley of the Albuquerque Metropolitan Area and cause flooding issues. Over the years, the West I-40 DMP was updated several times as numerous projects were built along the north side of I-40 between the Rio Grande and 98th Street.